REMEMBERING AND HONORING OUR MILITARY HEROES WHO GAVE ALL … BECAUSE FREEDOM IS NEVER FREE. On this Memorial Day 2018, Scared Monkeys sends a special thank you to all of the military men, woman and their families who have sacrificed their lives to that We, the United States of America, remain the home of the free because of the brave. We thank from the bottom of our hearts those who we can no longer thank in person for their sacrifice to this great Country. Thank you and God Bless you. We shall never forget you your service and sacrifice. During your Memorial Day get-togethers and picnics, please take time today to remember what this day is truly about and the men and women that we have lost. America has lost so many lives to protect the freedoms and liberties that we hold to be self-evident, that all men are created equal, that they are endowed by their Creator with certain unalienable Rights, that among these are Life, Liberty and the pursuit of Happiness. We have lost so many brave souls to not only protect our Freedoms, but the freedoms of others from tyranny. On this day we remember that Freedom is never Free and all those that gave all in their service and sacrifice to us. As always on this day and on a personal note I say thank you and you are so missed to my uncle Red who is buried in Arlington National Cemetery. To the man and my namesake who means so very much to me and taught me so much. My uncle served in Patton’s 3rd Army where he received the following medals. a silver star. bronze star and multiple purple hearts. So often he did not want to talk of what went on during his military server and his heroic efforts during WWII; however, true heroes are also humble. It was not until much later when I was in college and became a history major with a specialty in US military warfare and tactics did my uncle open up and provide me with the truth of what he experienced during his military days, some of that time spent in the Ardennes , better know as the Battle of the Bulge. A thank you to all that made the greatest sacrifice for us. May we honor your sacrifices and make you all proud. Memorial Day comes once a year, but we should hold our fallen heroes iin our hearts every day of every year. The United States of America is the greatest nation on earth because of those who came before us and fought and died for our freedom. REMEMBERING AND HONORING OUR MILITARY HEROES WHO GAVE ALL … BECAUSE FREEDOM IS NEVER FREE AND HONOR IS FOREVER. On this Memorial Day 2017, Scared Monkeys sends a special thank you to all of the military men, woman and their families who made the ultimate sacrificed so that We, the United States of America, could remain the home of the free because of the brave. We thank those who gave their lives in the name of liberty and freedom from the bottom of our hearts. 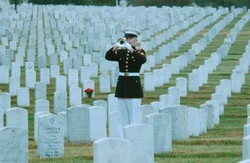 We can no longer than them in person, but we can honor their sacrifices to this great Country. Thank you and God Bless you, we shall never forget you your service and sacrifice. Please take time today to remember what this day is truly about and the men and women that we have lost. Remembering my uncle and all the brave heroes who sacrificed so much … I can remember like it was yesterday, but in fact it was more than 25 years ago, when I stood in Arlington National Cemetery for the funeral of my Uncle and namesake. I can remember the sound of Taps and the 21 gun salute as tears flowed down my face as I laid to rest my hero and a man that gave so much for his country and for me. A man who was the toughest and most honorable, proud and yet humble man I have ever known. God bless all. On this Memorial Day 2016, Scared Monkeys sends a special thank you to all of the military men, woman and their families who made the ultimate sacrificed so that We, the United States of America, could remain the home of the free because of the brave. We thank those who gave their lives in the name of liberty and freedom from the bottom of our hearts. We can no longer than them in person, but we can honor their sacrifices to this great Country. Thank you and God Bless you, we shall never forget you your service and sacrifice. Please take time today to remember what this day is truly about and the men and women that we have lost. Every year I take a moment and a personal note to honor and say thank you to a man who I miss so much, my uncle Red, who is buried in Arlington National Cemetery. My uncle served in Patton’s 3rd Army where he received the following medals. a silver star. bronze star and multiple purple hearts. He was one of the true humble heroes of WWII and our Greatest generation. God Bless you all. I can remember like it was yesterday, but in fact it was more than 25 years ago, when I stood in Arlington National Cemetery for the funeral of my Uncle and namesake. I can remember the sound of Taps and the 21 gun salute as tears flowed down my face as I laid to rest my hero. A man that gave so much for his country and for me. A man who was the toughest and most honorable, proud and yet humble man I have ever known. By all accounts he should have died in the Ardennes forest during WWII, but God had other plans. However, in many respects he did lose all as he came home forever changed. My uncle volunteered for WWII at age 18, although, when I review the records he was actually 17. He, like 5 of his brothers, took part in WWII. However, my Uncle Red saw the most action in Patton’s 3rd Army. Much of what he witnessed, he took to his grave as he lost so many Brothers in Arms. When he came home some 4 years later after having defeated the Nazis, his own mom, my grandmother, did not recognize him. 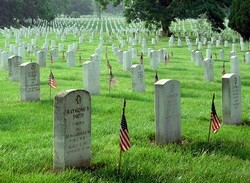 Thank you to the men and woman who have died to make us free. We can thank you best by honoring your sacrifices to defeat tyranny, socialism, Communism and Nazism by continuing to do so the same today. IDIOTS … YOU HAVE THE RIGHT TO MARKET THIS T-SHIRT AND AMERICA HAS THE SAME RIGHT TO NEVER, EVER SHOP AT PAC SUN EVER AGAIN. Are you serious? The retailer PacSun thought it in their best interest to display a t-shirt on Memorial Day weekend of an up-side down American flag. Really? This is how you disrespect the memories of those who have made the ultimate sacrifice to keep America free? Just what kind of a bunch of dirt-bags are you? Although, you have every right to market and sell what ever you damn well please, as American men and women have spilled their blood to give you that right, “We the People” also have every to boycott your stores and never, ever, ever buy another thing from you. And personally, I do not care whether you decide to pull the article of clothing from your stores because of the massive backlash you are about to receive, you have shown exactly what you are. YOU ARE A DISGRACE!!! Is it bad enough that you would disgrace the American flag, but you do so on Memorial Day. 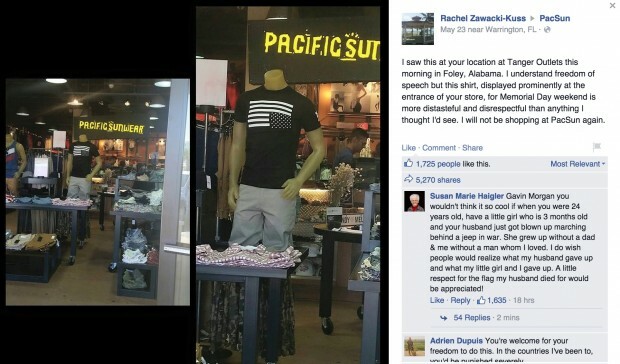 Retailer PacSun is feeling the wrath of customers and military veterans after a photo of a T-shirt on display in one of its stores on Memorial Day weekend went viral. The shirt features an upside-down American flag, a symbol that U.S. Flag Code makes clear is only to be used “in instances of extreme danger to life or property.” The shirt was reportedly first spotted at the store’s location at Tanger Outlets in Foley, Alabama. “As a combat veteran I refuse to step into your store ever again,” another apparent veteran wrote. “Not shopping here anymore,” a disgruntled Facebook user added, echoing the sentiment of hundreds of others. 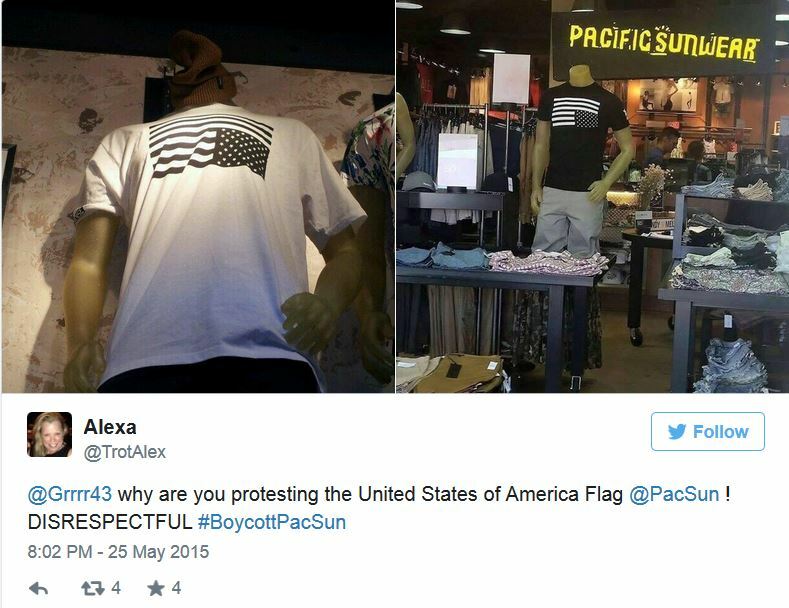 UPDATE I: PacSun removes T-shirt featuring upside-down American flag following controversy. A $24 T-shirt that was for sale online and at some PacSun stores could now cost the company thousands of dollars in lost sales.